The main purpose of us stopping in Chadds Ford was to visit the Brandywine River Museum. The museum holds work by one of our favourite artists, Andrew Wyeth and his father, N.C. Wyeth, who was a well-known (and brilliant) illustrator. Many of these images are shot around the Kuerner home, which a young Andrew stumbled across as a young boy whilst on a walk. The Kuerners lived next door to the Wyeths and Andrew spent a great deal of time there. He became very close to Karl Kuerner, the head of the house, and many of his paintings contain the Kuerner family and their home. The above image is Nellie's doghouse. All of the German Shephards owned by the Kuerners are named Nellie. 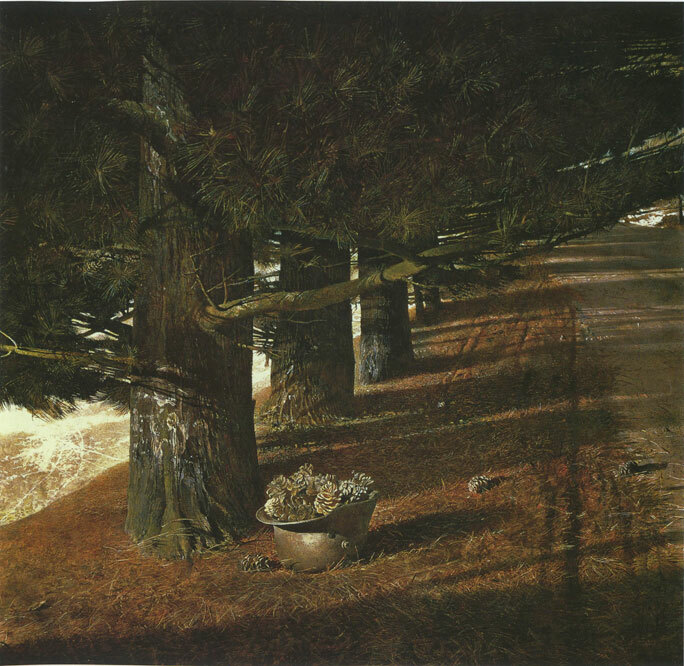 The above photograph shows the scene that Andrew Wyeth portrayed in "Pine Baron" 1976. The painting (below) shows Karl Kuerner's army helmet, which his wife was using to collect pine cones. The grounds and home of the Wyeth family, where Andrew grew up. The three final images are all shot inside the Kuerner's barn. The farm is still operational, and the Kuerner family has generously turned it over to the Brandywine Museum Trust as a means of preserving it as an historical site. There were cute little baby swallows nesting in the rafters and one of the Kuerner's farm cats, who was adorable! Visiting the Brandywine River Museum is one of my most special memories from our trip. I've been to so many art museums and I usually come out feeling disappointed and disillusioned with the art scene. There is something about the Brandywine region artists that is so special. Andrew Wyeth's work is even more amazing in real life, and it really struck a chord with me. It's really moving, and the location is simply beautiful (I'll share more images in the next post). If you are anywhere near Pennsylvania, I highly recommend visiting. I loved it so much I became a sponsor of the museum. I really wish I was closer so I could go back over and over again. If you're interested in the work of Andrew Wyeth, you can visit his website. The Brandywine River Museum site also has information on him and other artists of the region.